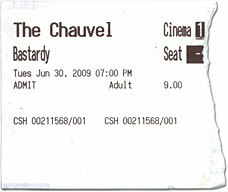 Bastardy takes you on a journey to accompany Jack Charles, an Aboriginal man who's in and out of jail for burglary. The film starts quite heavy-handed when Jack injects drugs which he's doing since many years. We are with him when he plays his guitar to entertain his mob, or when he "hits the boards" again to act in a short film. Acting once was his passion. In fact, in the 1970s Jack founded the first Aboriginal theatre company and performed with Australia's most renowned actors (Geoffrey Rush, David Gulpilil, Bill Hunter) and directors in feature films (The Chant of Jimmie Blacksmith, Bedevil) TV series and many, many plays. After a few months in freedom his petty crimes send him behind bars, a notorious pattern. On one occasion we follow him retrieving a ring in trying to avoid jail time. Jack was taken from his parents when he was ten months old, he is a member of the Stolen Generations. And when the film enters this chapter of his life we get an inkling of the story behind the man. "I was never raised in a loving situation," Jack reveals. "You become immune to sensitivity." No wonder that his relationship breaks down and he remains alone for most of his life. Bastardy is Aboriginal life uncut—very akin to Samson & Delilah. A film which makes you realise that there's much more behind that man with the wild hair who looks like a left-over rock star of the 1970s. Much more. A note in the end credits says it all: "Dedicated to the lost and found." Filmmaker Amiel Courtin-Wilson follows Jack over seven years. The title comes from a play written in 1972 by playwright John Romeril---Bastardy---based on the life story of Jack Charles, and performed by him in Melbourne. Born in 1943 Jack Charles is a member of the Stolen Generations, taken from his mother when he was 10 months old. Jack now spends a lot of time counselling others as part of a federal government leadership program that involves meeting with incarcerated and addicted men. The film is used in several drug and alcohol centres and prisons for educational purposes.